Yay! 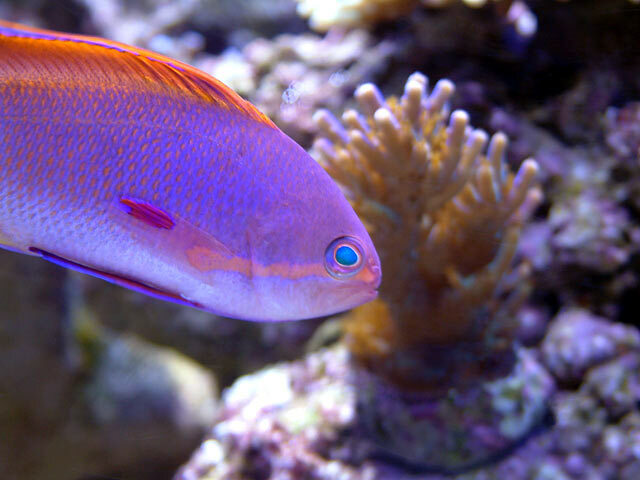 My new anthias order arrived!! I just watched a FedEx guy carefully carry my box to the front door (2:30pm). As if he knew that he had live fish in his hands. That's a nice change. 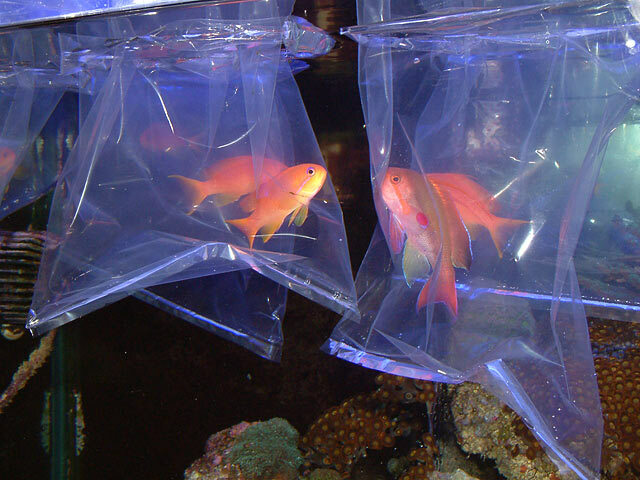 The anthias are now floating in opened bags (2:40pm). They are SOOOOOOOOOOOOO pretty!!! And kind of big. So at that point, I released them all. They are mostly in the rockwork at the moment, but I hope they'll get comfy in the next few days. 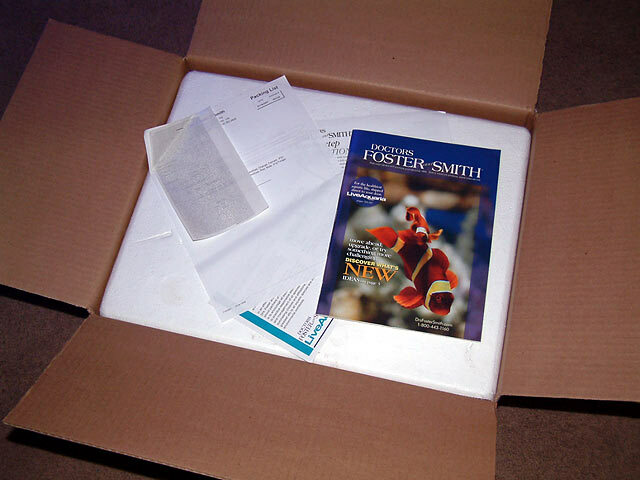 Thank you for your recent order and for taking the time to post these excellent pictures. 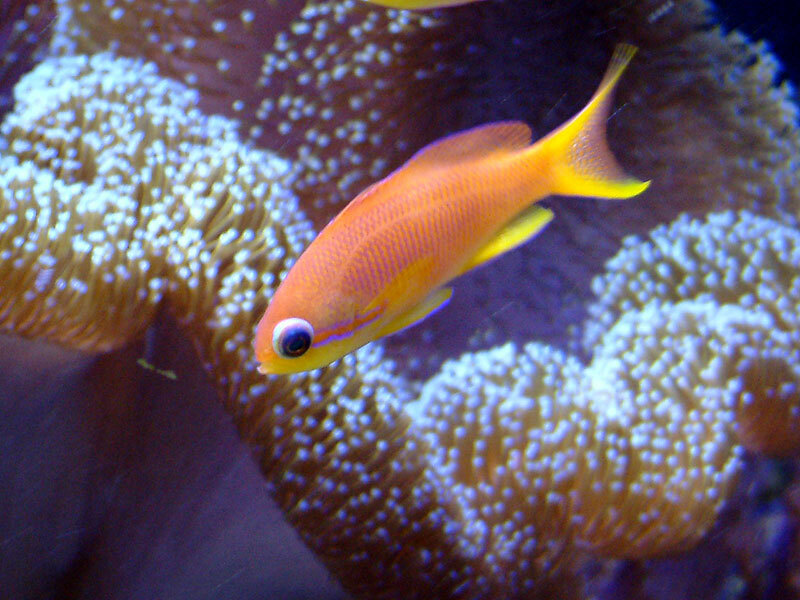 It's really great to share in your excitement with your new beautiful anthias. Very nice! 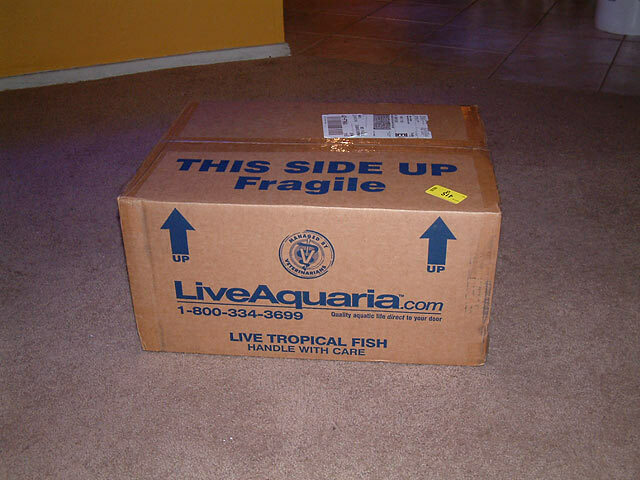 I had bartlett's from Live Aquaria (avatar picture) and the FedEx guy kind of took the box out of his truck and threw it up on his shoulder in a way lol. Anyway, they made it and they thought they went on a roller coaster. Here are a few more pictures. I saw 6 of them out this evening, but not the male nor #7. I will have to agree w/ SDguy. 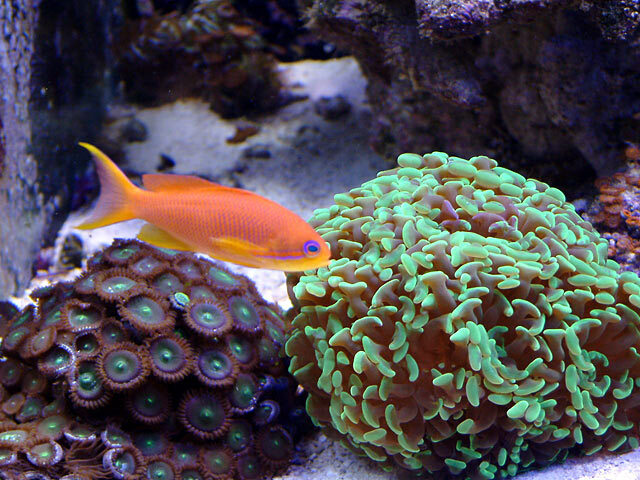 Anthias are an addiction. I have 2 females and 1 male Lyretails. I love them. Melev I am a big fan of your work, Great job. I hope if my military duties sends me back down that way I could stop by and check out the Reefer of the decade. The male it out! The male is out! Love the fish and the pictures aren't too bad either. 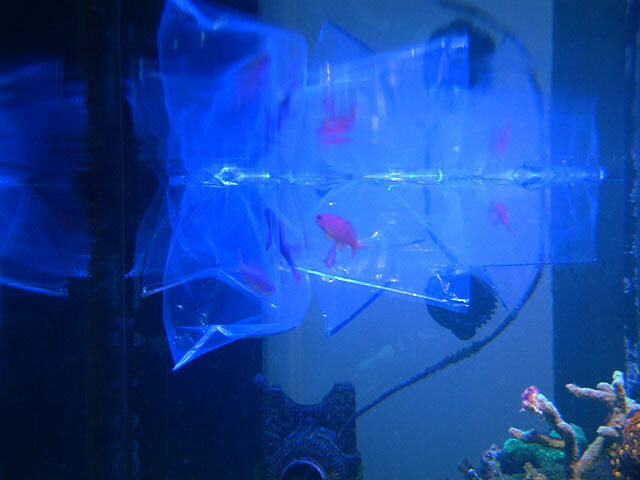 Cool fish melev. Now I'll take one of your new nano tanks you built free of charge, I'll pay shipping LOL! Just kidding. I just got back from being gone Friday, Saturday and Sunday. I counted 6, but I've only been home a few minutes. Hope the others are still doing well, just out of sight. Wow, those are great! Lyretails are my favorite fish. Wish I had the room for them. My system is small, so I've got three Bartletts that are about two years old now. Two of them run up to the glass like puppies in a pet shop window, and the other hides in a hole until I put food in the tank. Are they staying fat? How many times a day are you feeding them? I'm feeding them at least once a day. 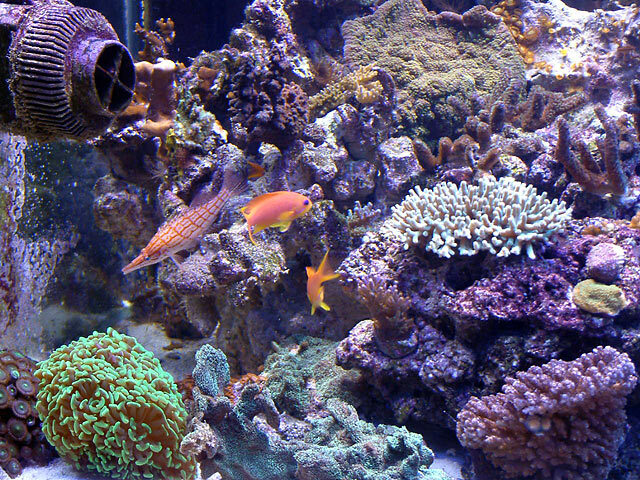 I'm trying to resist feeding often and polluting the tank. 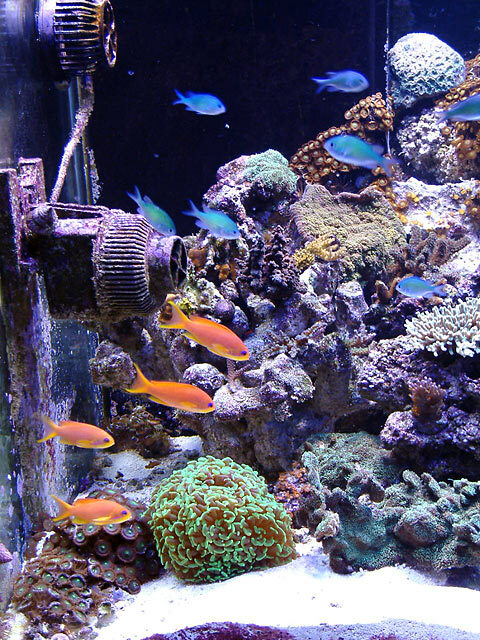 As of now, I have been able to count all 8 fish in the reef. One has pop-eye, but I think it will heal on its own. If you would like any assistance or suggestions regarding treatment options for pop-eye please let us know and we will be happy to assist you any way we can. Thank you for keeping us updated on the condition of the new arrivals. 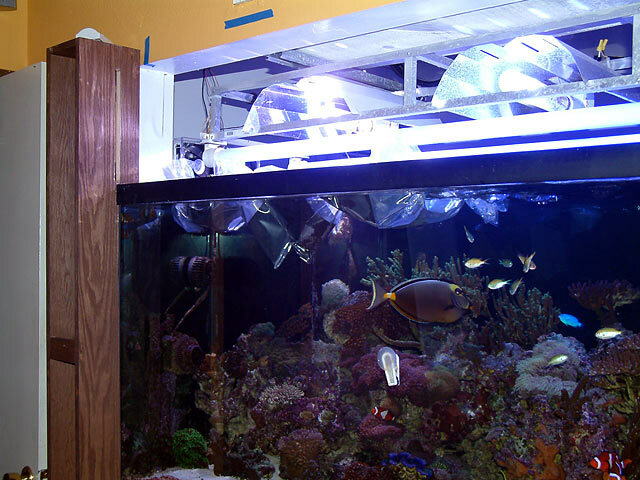 We look forward to hearing from you soon and enjoy the pictures of your aquarium and the inhabitants. Joyce, please do post what you recommend for pop eye. Here's another picture of the male, close up from last night. 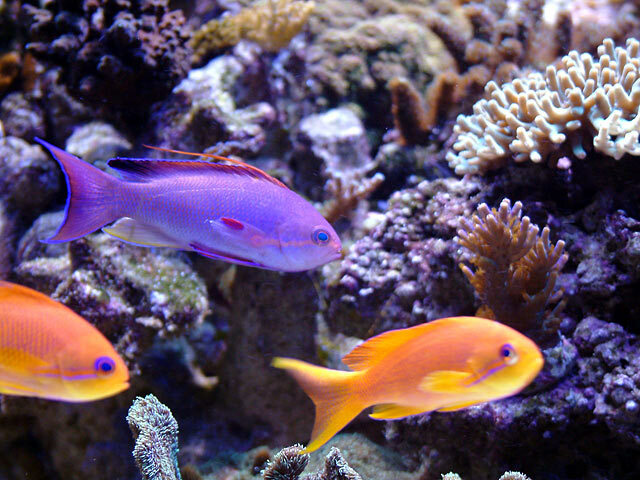 The male Anthias you have pictured truly captures the vibrant coloration these specimens have. 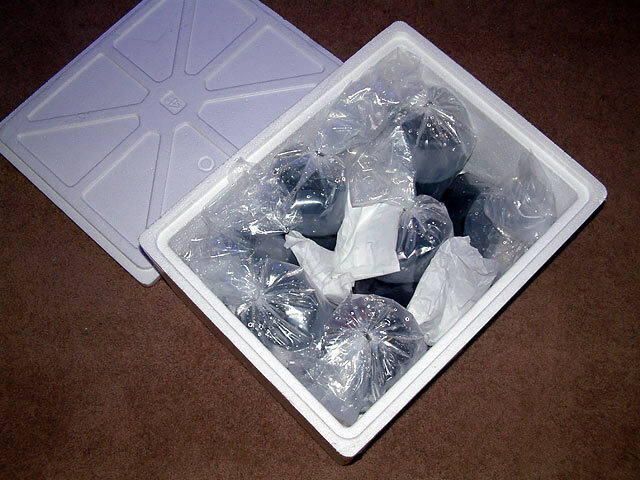 You may want to try soaking the frozen foods you are offering in a vitamin supplement and a broad-spectrum antibiotic during the healing time. 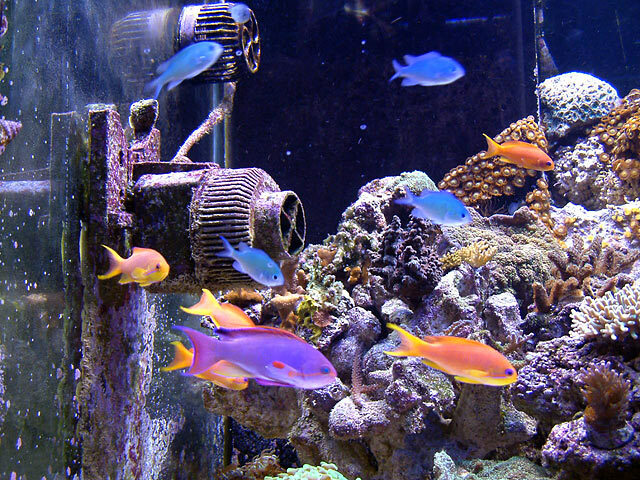 Using Selcon and Tetracycline will help to boost the immune system of the fish and ensure the Anthias has the best health for the healing process. 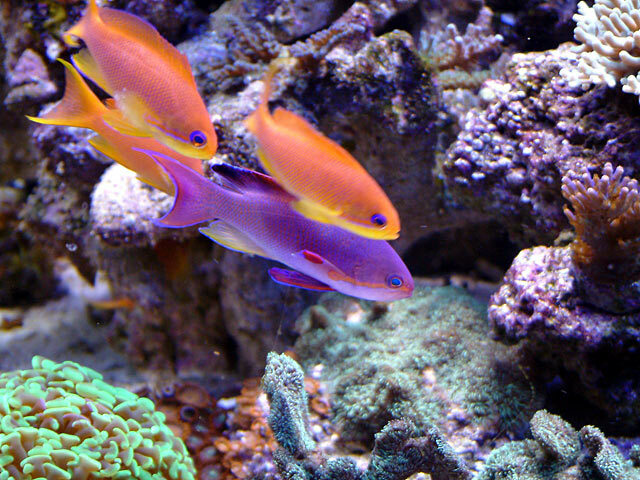 what kind of Anthias are those? I had a question on quarantine. 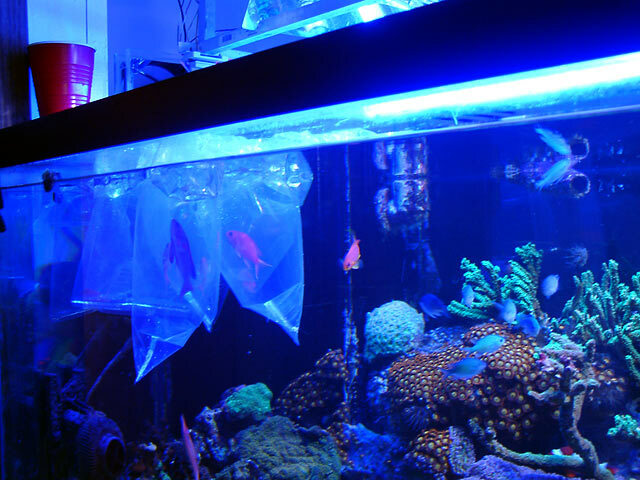 It seemed that you put your fish into your DT right away, without quarantining. Do you have a belief about quarantine/not to quarantine? I only ask because at first I didn't quarantine either, but now I do after an outbreak of ICK (not wishing anything bad on your tank). 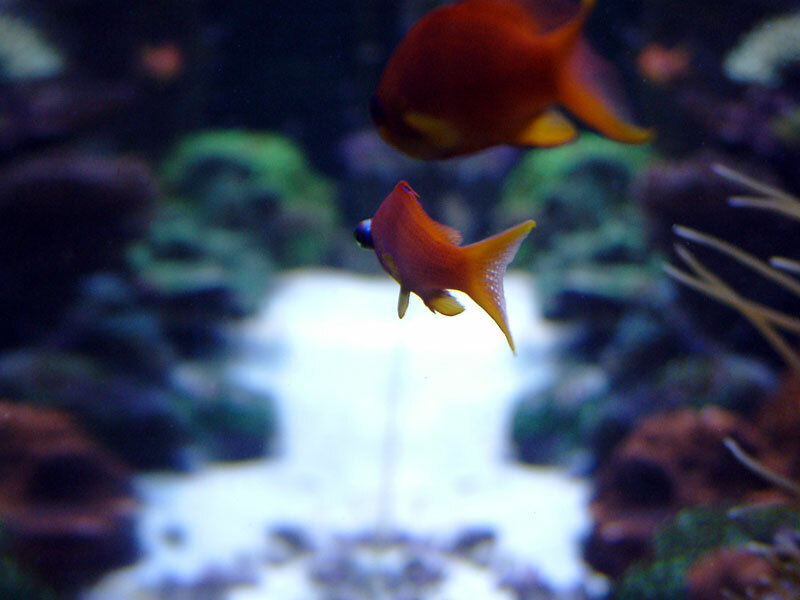 Beautiful fishes by the way! 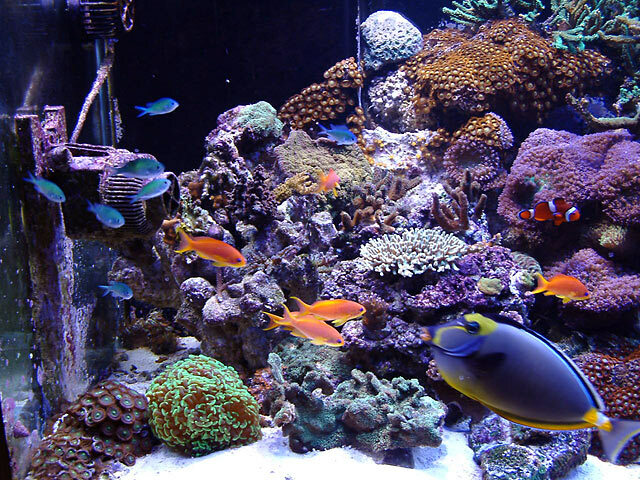 I really prefer to quarantine fish and corals whenever I can. 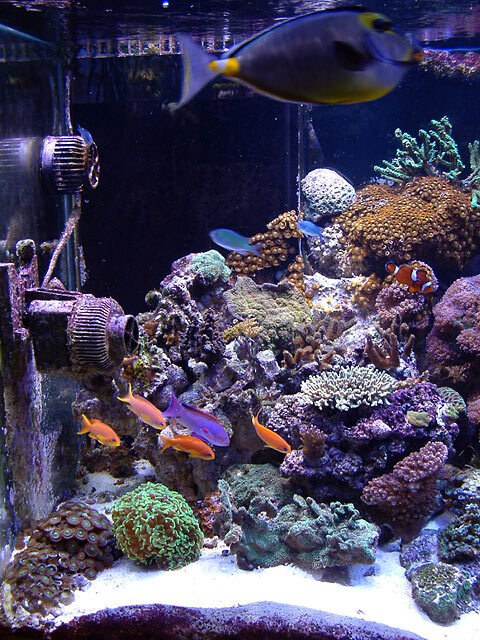 However, I had 8 fish come in and one 14g cube full of saltwater. 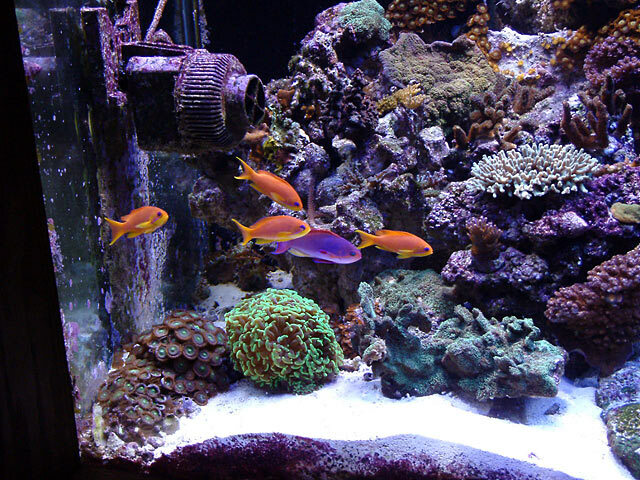 I had a feeling that was doomed from the start, so they were added directly to the tank. 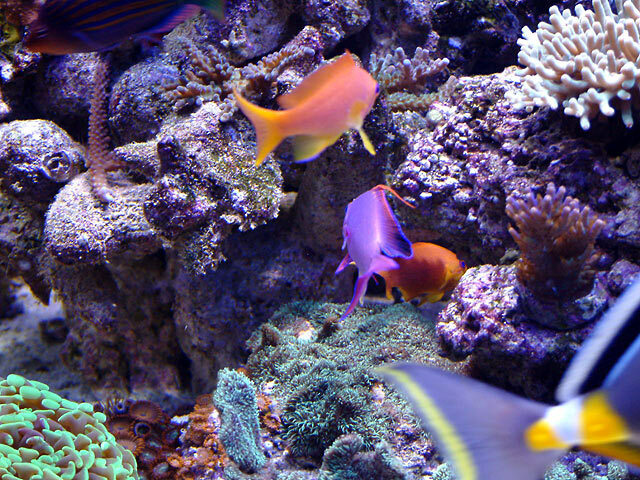 As of yesterday, I counted all 8 anthias swimming. Those lyretails are gorgeous, especially the male. Marc, do you mind telling me which type you purchase? Fiji, SE Asia or Eastern Asia. Thanks.